All volumes are prepared to work interactively with both Tanakh: Interactive Hebrew Bible and Hebrew-English Tanakh: the Jewish Bible which can be purchased separately. 1. Genesis – Skinner, J. J. 2. Numbers – Buchanan Gray, G.
3. 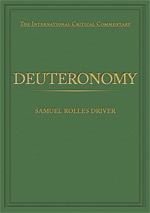 Deuteronomy: 3rd edition – Driver, S. R.
4. Judges – Moore, G. F.
5. Samuel I and II – Smith, H. P.
6. Amos and Hosea – Harper, W. R.
8. Micah, Zephaniah, Nahum, Habakkuk, Obadiah and Joel – Bewer, J. A; Smith, J. M. P.; Ward, W. H.
9. Haggai, Zechariah, Malachi & Jonah – Mitchell, H. G; Smith, J. M. P.; Bewer, J. A. 10. Psalms: Volume 1 – Briggs, C. A.; Briggs, E. G.
11. Psalms: Volume 2 – Briggs, C. A.; Briggs, E. G.
12. Proverbs – Toy, C. H.
14. Job: Volume 2 – G. Buchanan Gray; Driver, S. R.
15. Ecclesiastes – Barton, G. A. 16. Esther – Paton, L. B. 17. Daniel – Montgomery, A. A. 18. Ezra and Nehemiah – Batten, L. W.
19. Chronicles I and II – Curtis, E. L.; Madsen, A. A. For over one hundred years, the International Critical Commentary series, published by T&T Clark International, has long held a special place among works on the Bible. It has sought to bring together all the relevant aids to exegesis—linguistic and textual no less than archaeological, historical, literary and theological—with a level of comprehension and quality of scholarship unmatched by any other series. "I look it up every time I have a text critical question or questions of general interpretation." No attempt has been made to secure a uniform theological or critical approach to the biblical text: contributors have been invited for their scholarly distinction, not for their adherence to any one school of thought. These are some of the best commentaries ever published if you want to get the technical details represent classical results of historical critical methodology. Although this series has always been intended only for the serious student some knowledge of Biblical languages, Varda Books' edition has drastically reduced the level of difficulty of its comprehension by making all titles fully searchable with sophisticated internal navigation with more then 300,000 hyperlinks. "The price, the amazing ability to manipulate the size of the text—the print in original books was too small to read—to be able to search one book or all at the same time, to instantly go from any biblical references to massoretic text of Tanakh: what more could any student of the Bible possibly want?" Below are 1 - 17 of the 17 items	sorted in "A-Z by Title" order.